By Lauryn on August 9th, 2013 . Filed under: News, Other . Have you been looking for a reason to visit Queensland, Australia? Well, if you are going to be around and don’t mind spending $45 on a cupcake, you might want to consider adding a visit to Crave Cupcakes in Toowoomba to your itinerary. There you can place an order for one of the very limited edition two-dozen Golden Cupcakes that they will be baking. Of course, you only have until August 14th to place the order and they must be picked up on August 17th. But why would anyone want to spend $45 on a cupcake? Because it’s not just another bakery on the corner cupcake. The Golden Cupcake is a masterpiece, a once in a lifetime cupcake. The cost of the ingredients is just one factor for limiting the number of Golden Cupcakes to just two-dozen. For three months, Crave Cupcakes’ Chef Jason Janetzski perfected the decadence that is the Golden Cupcake. It isn’t a cupcake that will be easily or cheaply replicated at home. Macadamia and raspberry have been added to the single origin chocolate cake baked from the highest quality ingredients, filled with salted caramel sauce. 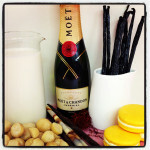 The icing, combining saffron and orange blossoms, is topped with a Moet & Chandon champagne macaron that has been garnished with gold dust. While the Golden Cupcake is certainly the most expensive treat Crave Cupcakes has concocted, it’s probably not be the oddest flavor combination, depending on the way your taste buds lean. 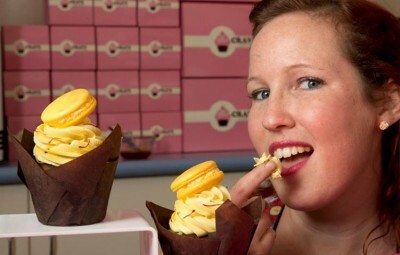 Offering macarons as well as cupcakes, Crave Cupcakes is the home of a maple-bacon flavored cupcake and will reportedly have a cheeseburger flavored macaron on the menu soon.